Di Sotto Enoteca Old-world wine list and Mediterranean small plates: Scott Harris has nailed the formula at Purple Pig and Davanti Enoteca, so why mess with a good thing? 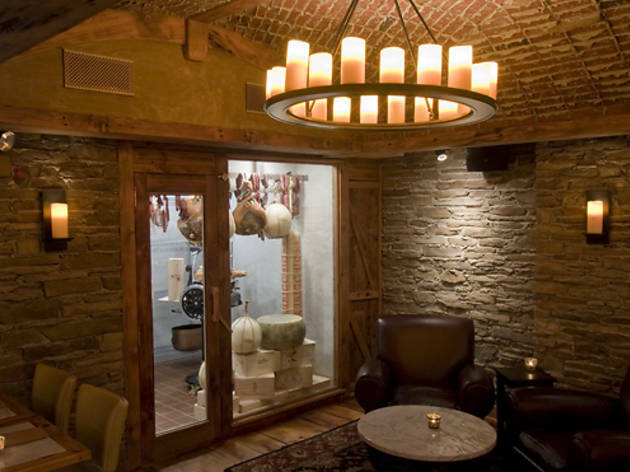 Admittedly, the scales at DiSotto (in the cellarlike basement of Francesca’s on Chestnut) tip toward drinking—the food is limited to antipasti, bruschette, cheeses and salumi. But when you’re spreading thick ricotta and fragments of honeycomb on toasted bread or sampling warm, marinated olives or indulging in the toast with a truffled egg yolk at its center, the appeal of this wine bar can’t help but feel unending. 200 E Chestnut St (312-482-8727). El: Red to Chicago. Bus: 10, 33, 125, 143, 144, 145, 146, 147, 151, 157. Mon–Thu 5pm–midnight; Fri, Sat 5pm–1am; Sun 5pm–11pm. Average glass of wine: $9. D.O.C. Wine Bar This cozy wine bar is a sibling of next door’s Dunlays on Clark, a casual bar/restaurant, but the high ceilings here give it some kind of urban barnyard feel. The bottle selection is excellent (though we wish there were more glass options), and you won’t find even the slightest whiff of pretension, despite the mostly yuppie clientele. 2602 N Clark St (773-883-5101). El: Brown, Purple (rush hrs), Red to Fullerton. Bus: 11, 22, 36. 5pm–2am. Average glass of wine: $9. Rootstock Wine & Beer Bar The novella-length menu at this low-key alcove contains loving and helpful descriptions of an impressive selection of wines and beers. And thanks to the array of small plates served until 1am, this is the kind of warm, simple neighborhood place you’ll never want—or need—to leave. 954 N California Ave (773-292-1616). Bus: 53, 66, 70. Mon–Sat 5pm–2am; Sun 11am–4pm. Average glass of wine: $8. 694 Wine & Spirits When this place was Juicy Wine Co., it was an intimate, loungey wine bar with an impressive charcuterie program. 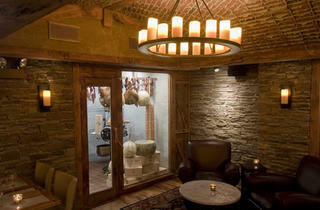 Now, it’s…an intimate, loungey wine bar with an impressive charcuterie program. The decision not to offer a big spirits selection—and thus to be one of the few spots not trafficking in cocktails—might annoy martini drinkers (and, to be fair, they’d be a good match with this place’s clubbier elements). Winos, on the other hand, will be perfectly content. 694 N Milwaukee Ave (312-492-6620). El: Blue to Chicago. Bus: 56, 66. Mon–Thu 5pm–1am; Fri, Sat 5pm–2am; Sun 5pm–midnight. Average glass of wine: $10. The Tasting Room Out of the way? Yeah. Still a great wine bar? For sure. You’d be hard pressed to find another wine bar with a better list. And even harder pressed to find one with as great a view of the skyline. 1415 W Randolph St (312-942-1313). El: Green, Pink to Ashland. Bus: 9. Mon–Fri 5pm–1am; Sat 5pm–2am (closed Sun). Average glass of wine: $10. Webster’s Wine Bar We’ve missed many a movie because we stopped by this wine bar next to Webster Place theater for a preshow cocktail. When tasting pours are this affordable (and interesting), we pretend it’s for educational purposes and stay all night, soaking up the dark, Bohemian vibe and munching on tasty cheese plates. We’ll catch the movie on Netflix. 1480 W Webster Ave (773-868-0608). Bus: 9, 74. Mon–Fri 5pm–2am; Sat 4pm–3am; Sun 4pm–2am. Average glass of wine: $8.